As an ‘ethical consumer’ you might expect that my first check point when clothes shopping would be the origin of the fabric or searching out information on the factory that a garment has been made in. Maybe I check for natural or recycled fibres. I understand why you would assume that but you’d be wrong. The first thing I look for is design. Is it fun? Is it bright? Does it have a print that makes me gasp with unfiltered delight? Does it have amazing sleeves or a larger than life bow at the neckline? Those sorts of questions are what matter first and foremost. I want to absolutely adore everything I buy. I don’t want to compromise to accommodate my personal ethics, I want brands and designers to create incredible clothes that encompass them. Some are doing a great job at it, creating collections that are chic, daring, interesting, playful and innovative. (Kowtow, Riyka, Mara Hoffman, Eliza Faulkner, Insane In The Rain, Stella McCartney, Osei Duro and Zuri to name just a few). 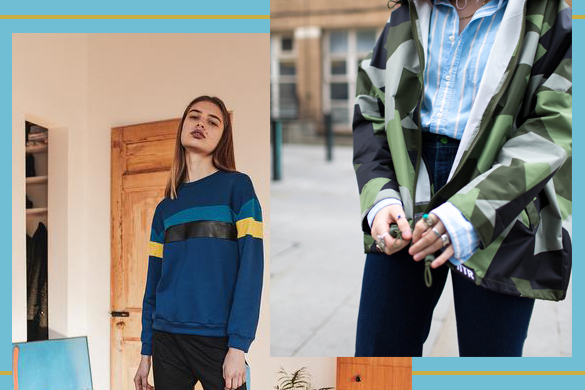 But, unfortunately, there’s a lot of ethical and sustainable fashion that I’d be all too happy to leave hanging on the rail and it’s giving the sector a bad – or bland – name. I’m not out to condemn sustainable fashion (I wouldn’t dedicate hours and hours to writing about it if I was) but I always want to be objective where it’s concerned. After all, nothing ever got better by pretending everything about it was 100% perfect. Sustainable fashion shouldn’t be a separate branch of the industry; a second choice that only the most dedicated engage with. It should be fashion. Full stop. It should appeal to people who don’t care about pesticides, unions and water pollution. It should be a first choice not a trade-off to satisfy someone’s morals. If I were to shop on the high street, I could look exactly like I want to with no hassle. I could find colour pop blazers, look-at-me dresses and killer blouses. It would be easy. But until the high street gets its act together (which frankly, I can’t see happening at all in any real, holistic way) I’m not going to support it. So, I look elsewhere and it’s harder to find what I’m looking for. There are plenty of basics. I could drown in tunic tops, breton tees, slim line trousers and jersey dresses but I’ve never been a basics kind of person. I have to really search for the kind of vibrant, exciting pieces I want and, as someone who’s trying their best to promote sustainable fashion at every opportunity, it’s frustrating. It’s fantastic if a top is crafted solely from plant fibres or if a dress has been manufactured in a safe factory run by management that allows its staff to unionise but it doesn’t mean anything if it’s not appealing enough to sell. I don’t want to wear a consciously crafted shapeless sack or a fair trade coat that’s duller than Saturday night TV. I want to wear clothes that fill me with energy and confidence; the type of clothes that people comment on; the type of clothes that generate questions and spark a conversation about their origins. I want design to come first and for ethics and sustainability to be crafted around it. Sustainable fashion, as it exists now, is still in its infancy, so we need to allow it time to catch up and to ditch the ‘sustainable’ prefix and niche reputation. But we can’t afford to take too long about it when both people and the environment are hanging on its success.